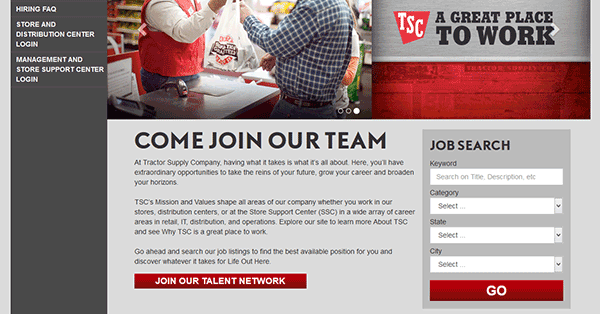 Download the Tractor Supply Company job application via the link on this page. 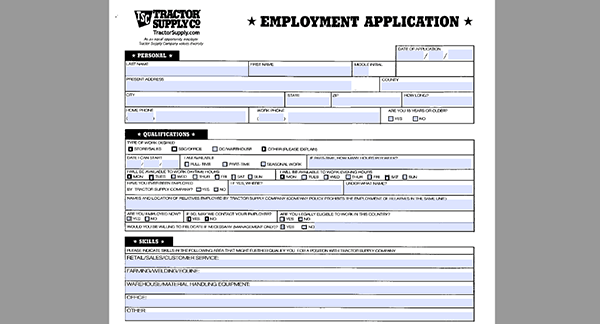 The application can also be filled out online (by going to the TSC Careers website). Corporate, distribution, support, and retail positions can all be applied for on the website. About the Company: Tractor Supply Company is the largest chain of farm supply stores in the United States. There are over 1,400 locations (in 48 states of the country). Step 2 – Search current openings by keyword, category, state, or city. Step 3 – On the job search page, click the link of the job you’re interested in. Step 4 – Review the purpose, responsibilities, duties, etc. and then click the “Apply Now” button (near the bottom of the page). Step 5 – Scroll down the description and then hit the “Learn More/Apply” link. Step 1 – The first step is to download the form (hit the button at the top of the page). Step 3 – Complete the “Qualifications” and “Skills” subsections by entering all of the required information into the appropriate input fields. Step 5 – Complete the “Education” and “References” subsections, and then sign/date the form.